Juliet currently resides in South Wales, but loves to explore and work in other areas around Britain. She loves sharing her love for the outdoors and helping people develop their own skill and comfort level so that they can experience wild places independently. 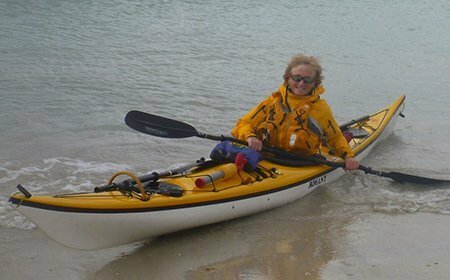 In her spare time she enjoys circumnavigating Scottish islands by sea kayak (she still has a lot to do, there are over 790 of them!) and caving. Originally a secondary school teacher, her love of the outdoors led her to undertake a post graduate diploma in outdoor education, in Scotland – and she has never looked back! Other passions include: cycling, sailing and skiing. Having spent the past twenty years running a Local Education Authority outdoor centre, she is now enjoying the flexibility and variety of work that being a freelance instructor offers. Juliet is excited about paddling around the beautiful Scottish coastline during the summer months.